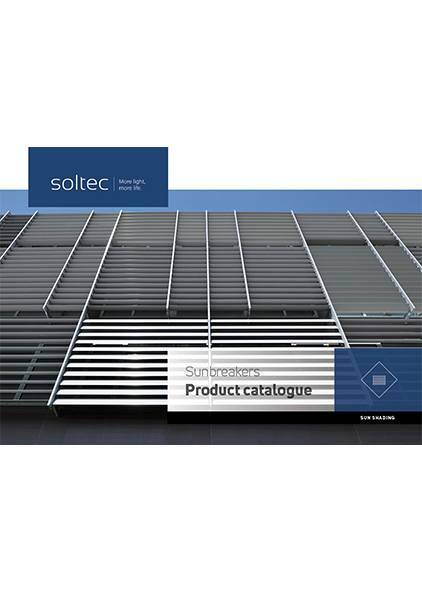 Soltec’s sunbreakers F provide an affordable solution for a modern aesthetic appearance of the building and at the same time ensure protection against overheating and glare. In winter, you can increase the natural illumination of the object by removing certain blades. Example of use: the glass surfaces of industrial facilities/building staircases/roofings where ventilation is necessary. is made of a 0.42 mm thick rolled sheet, with 80 mm wide blades. is made of extruded aluminium profile with dimensions of 100 mm, which uses a click fastening system for installation on a vertical aluminium holder. The system is suitable for vertical shading of glass façade surfaces. is made of a 0.7 mm thick rolled sheet, with 97 mm wide blades. is made of extruded aluminium profile with dimensions of 152 mm and is screw mounted into side guides. The system is suitable for vertical or horizontal applications. Steel profile guides are fixed into a vertical construction or wall at a max. height of 120 cm, painted in RAL colours. 80 mm alu blades are fastened into guides at the 45º angle using a “click” system. A mosquito net can be fixed behind the guides.